This Award winning, mountain contemporary home is one of the premier ski in/out properties in Snowmass - directly on the ski slopes – featuring 6 bedrooms, 6 bathrooms, 5 of which are en-suite, and a 2-car garage. Gourmet chef's kitchen, with both counter seating and separate table overlooking slope. Elegant large dining room. Large living room with several seating areas, game table, and breathtaking views. Plus, a unique expansive rooftop deck offers 360 degree views, a gas fire pit, and plenty of room for entertaining. Also wrap around balcony, overlooking mountain stream & pond, on expansive property. This Home won Nine (9) Awards in the 2011 Roaring Fork Valley Parade of Homes, sponsored by Mountain Living magazine. It won the Special Recognition Award, in addition to runner up awards for; Best in Parade, Best Master Bedroom, Home Exterior Design & Elevation, Best Interior Finishes,Builder Concept & Workmanship, Landscape & Outdoor Living Space, Best Kitchen, Best Interior Furnishings. Accessible from anywhere on the mountain - ski access couldn't be easier - the trail leads right to your door! This is the rare vacation home find that you've been looking for. From the moment you walk in, you are greeted with floor to ceiling windows with incredible views of the surrounding mountain landscape. Located in Wood Run directly on Adams Avenue ski trail, this home is over 5,000 square feet , and acre of private property sleeps 14, -with plenty of room to spread out comfortably. In the summer, the yard becomes your own private park, with a natural stream that flows into a pond, surrounded by large Aspen trees and Blue Spruce. • Cherry and clear alder custom cabinetry. Hand-scraped rustic American black walnut flooring.Giallo Fiore stone facings on the fireplaces in living room, library, and master bedroom. • Enormous handmade limestone hood, custom-designed and imported for the 60-inch Wolf Range. All countertops and bathroom vanity mirrors are custom designed. The powder bath and bunk bath are custom soap stone carved by a fine Colorado craftsman, the kitchen and breakfast bar area countertops are of a special-order granite. • The dining room table is custom made with milpa burl wood top and a solid ebony base, sized to perfectly fit the space. All railings custom designed by hand. • Intricate custom designed tile designs utilizing marble and glass and hand made tiles throughout. All furniture/fabrics are custom. Sitting on an acre of property, perfectly located right on Adams Avenure directly above the base village...SKI IN after a great powder day, click out of your skis and put your feet up in front of a warm fire, relax with a drink or hot meal prepared in your fully equipped gourmet cooks kitchen. Sit out on the back deck and watch the skiers go by. Take a dip in your private outdoor HOT TUB, or go inside for a JACUZZI or STEAM SHOWER, available in most bathrooms...wonderful after a day on the slopes! Enjoy your favorite programs on the impressive UHDTV's, and get a good night's sleep in one of several king size beds, while the others snooze happily in their separate rooms. Each bedroom has tremendous views, with FRENCH DOORS leading to the patio, and each has it's own private bath with STEAM SHOWER AND JACUZZI. High speed Wi-Fi and a cozy OFFICE with a fireplace and 46 in TV(Doubles as a bedroom). Spectacular VIEWS abound via oversized picture windows. In the summer-season, it is a beautiful mountain haven, sitting on an ACRE of land, with a mountain stream and private pond in the back yard. Photos cannot adequately represent the stunning mountain home that awaits you and your family. Your needs are diligently attended to via a highly qualified property management team and very experienced housekeeping team. We have several family-oriented VRBO properties in the area, if this one does not fit your party, please view our other VRBO listings! #99448, #130212, #143795, #154175. Ideal location and a fantastic home! We looked for a house that was this well-located for awhile before finding this one - it is in the perfect spot, just a minute up-mountain from the base. Snowmass has undergone a tremendous base village upgrade and an amazing renaissance. 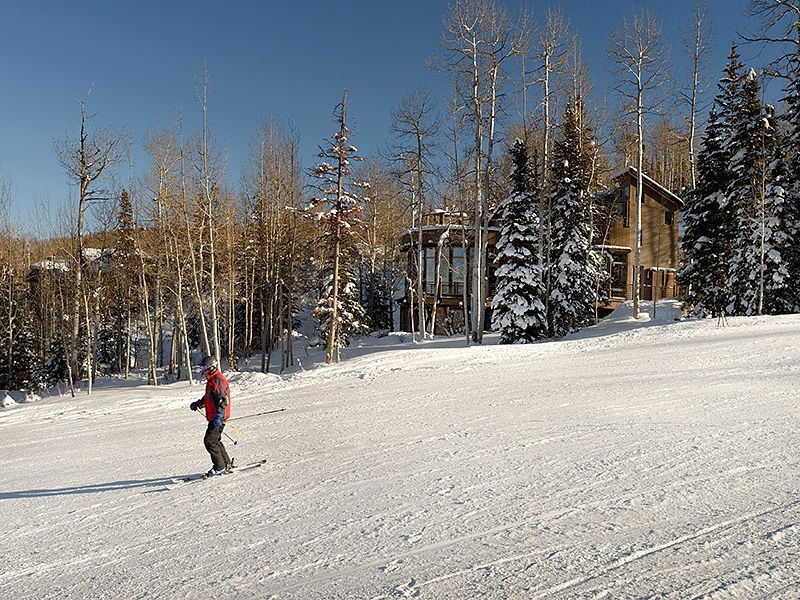 Just minutes from upscale and fun Aspen, yet friendly and family-oriented, Snowmass is consistently ranked among top family ski resorts in the country. This is a perfect spot for a big family, several families, or group of adults- plenty of room to sleep, to all dine together, to enjoy the mountain at its finest. Skiing for every level of skier, and a comfy office with Wi-Fi access. Property has it's own mountain stream and pond on property. Exceptional views of slope and mountain, watch fireworks from living room or roof-top deck! Large laundry room, with granite counter, sink, etc. Room for two cars, heated, lots of additional parking in motor court. Snowmelt system for Driveway! (3) Hot tub Patio, BBQ seating area, and rooftop deck with exceptional views! Brand new and very large with view overlooking slope! Deluxe office, wine bar,Wine cellar, steam showers, Jacuzzi's, Gas fireplaces, private outdoor hot tub overlooking slopes, Flatscreen TV's with DVD/Blue-ray in all bedrooms, Stereo with Ipod dock capability, outdoor dining area, 60" HDTV/DVR, Best ski in/out access on Adams Avenue. Great home, excellent ski access and lovely owner! We stayed as a group of friends with two young children in Feb 2019. The property is exceptional with great communal spaces and various seating options. The main bedrooms are fantastic; often houses have a great master and the rest are sometimes lacking... not here, you will be extremely happy with any of the bedrooms and their gorgeous bathrooms. We didn't need the 6th bedroom so left this as a study which was great for the odd bit of work that cropped up. Our kids loved the bunk room; much den building and hiding! The kitchen is very well appointed, everything was thought through. It is a coffee lovers dream with all the different options available! Ellen was a fantastic host, helping us both before and during our stay, and going well out of her way to make sure we had everything we needed. Thank you! Daily housekeeping was a little detail that I didn't realise we had before we arrived. It was a lovely touch and made the trip so much more relaxing to know someone was straightening up during our day skiing. The Snowmass area is fantastic for kids. Ours were a little too young for ski school but there is plenty in the Snowmass base and Aspen itself to keep them occupied for a week. All in all a fantastic trip and a gorgeous, luxury property that exceeded out expectations (which are pretty high). We will be returning! From the moment we booked this home, the service was exceptional. From management to housekeeping staff we were extremely pleased throughout the entire process. The home is beautiful and Ellen made sure everything was perfect prior to our arrival. One of the most memorable summers we have had! One of our best summer experiences ever in a luxury Snowmass house! My husband and I were very fortunate to spend 2 weeks this summer in this fabulous Snowmass Luxury home! This is the ideal location in Snowmass- up high on the mountain with great views! The house is centrally located between Aspen as well as the charming towns of Basalt and Carbondale. This home is beautifully furnished throughout with a well stocked gourmet kitchen. I was very pleased to find the linens and towels were high quality. We enjoyed the large hot tub in the beautiful backyard too! A wonderful feature in the backyard is the running stream and large pond. It was so nice to sleep with windows ajar and hear the sounds of the stream! The rooftop deck made for special cocktail hours! We look forward to returning to this beautiful Snowmass house again! We can on,y imagine how fantastic this house would be in the winter with the ski-in/ski-out location. Our 2 week stay at this house made our annual summer trip to Snowmass one of the very best! Excellent home in a fantastic location. First class accommodations with a wonderful owner. The absolutely perfect vacation home with every comfort. We love coming to this incredible home! This home was amazing- sprawling, clean, comfortable and elegant. Really top-notch. Easily could fit a dozen people here. We were there in summer, and the weather was spectacular, but it is ideally located for winter, with super easy skin in-out access literally right in your backyard. Big, clean private attached garage, family-sized outdoor hot tub, wine fridge, chef's kitchen, floor-to-ceiling windows, bedrooms on various levels of the home, each with their own full bath and large closets. It was lovely to see deer visiting the property, and there are amazing views from the roof-top deck. I have stayed in other rentals that felt kind of grimy and well-worn, but not here...I can't say enough about this property, except we can't wait to go back! Owner must re-rent if cancelled in order to provide a refund. A fee of 15% will be deducted from refunds. Refunds will be in full only if the re-rental is for the same or greater amount. If re-rented for a lower amount that less the 15% will be the amount of the refund. For bookings of 30 days or more taxes are not applicable.